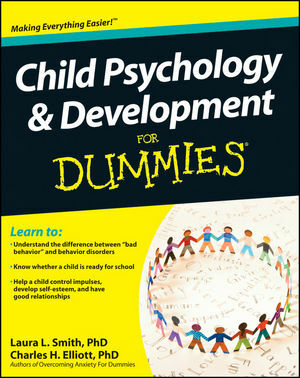 With new discoveries in mental disorders that affect children, Child Psychology & Development For Dummies provides an informational guide to cognitive development at every stage of a child's life, as well as how to diagnose, treat, and overcome the cognitive barriers that impede learning and development. An essential guide for parents, teachers, and caregivers, Child Psychology & Development For Dummies provides a detailed overview of an average child's cognitive development, how to detect abnormalities, and what to do next. Laura L. Smith, PhD, is a clinical and school psychologist. Charles H. Elliott, PhD, is a clinical psychologist and founding fellow of the Academy of Cognitive Therapy. Together they have written several books, including Borderline Personality Disorder For Dummies and Obsessive-Compulsive Disorder For Dummies. Part I: Understanding Children: The Big Picture. Chapter 1: Exploring Child Psychology. Chapter 2: What Makes Kids Tick? Chapter 3: Goals of Growing Up. Part II: Watching Kids Grow. Chapter 4: Pregnancy, Delivery, and the First Year. Chapter 5: Tackling the Toddler Years (Ages 1–4). Chapter 6: The Middle Childhood Years (Ages 5 – 12). Chapter 7: Traversing the Teen Years (Ages 13–18). Part III: Growing Great Kids. Chapter 8: Creating Functional Families. Chapter 10: Building the Right Village for Kids. Part IV: Spotting Troubled Development. Chapter 11: Facing Physical Problems. Chapter 12: Understanding Problems That Interfere with Learning. Chapter 13: Addressing Autism Spectrum Disorders. Chapter 15: Exploring Behavior Disorders. Chapter 16: Looking at Trauma and Abuse. Part V: Getting the Right Therapies. Chapter 17: Types of Therapy That Work. Chapter 18: Enhancing Educators’ Efforts. Chapter 19: Knowing What Parents Can Do. Chapter 20: Ten Ways to Calm Kids Down. Chapter 21: Ten Signs of Gifted Kids. Chapter 22: Ten Signs That a Kid Needs Help.